Some people celebrate Christmas in July, but once once July hits and Summer is almost over, I start looking forward to the parts of Fall that make me happy. This does not include school starting, but it does include Halloween! So excuse me while I swoon over a few of the fun Halloween ideas that have started popping up, like these fun spooky owl pretzels that would make a fun treat for a Halloween party. The kids could even assemble them with a little frosting if you pre-dip the pretzels. Then it could count as an activity and treat...and edible craft! 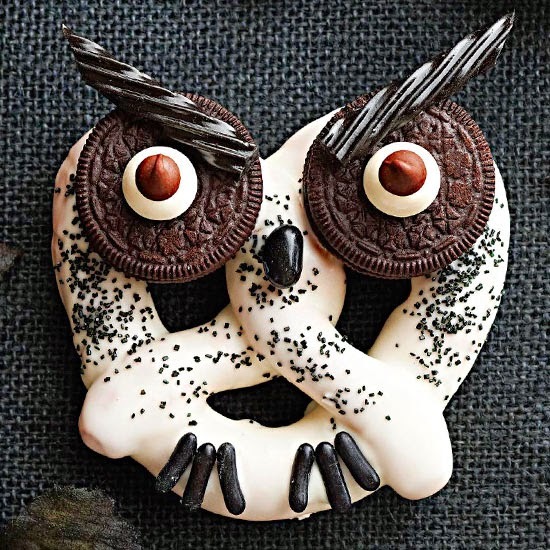 You can get the directions for these haunted hooting owl pretzel treats over at BHG.